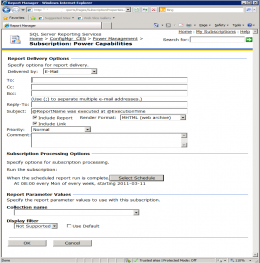 How to migrate only one specific folder with USMT. I really had to scratch my head to solve this task. Maybe there’s an easier way to do this but this is how I solved a problem with a customer that only wanted to migrate one specific folder with USMT. 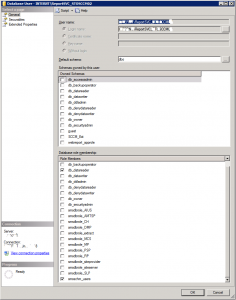 All their users save all their personal data on their C-drive in a folder with a common name. I’ll call the local folder “Personal Data” in this blog post. USMT is not good at opting in specific folders only. It’s more built to migrate everything plus that extra folder you need and then opt out some folders or filetypes that shouldn’t be included. But how do you exclude the C-Drive and at the same time include only one folder from the same drive? It turns out USMT has some very quirky behavour. It did migrate my “Personal Data” folder but it also migrated all my *.wav default sounds in the Windows folder, some fax-coversheets and even some *.dll files that definitely wasn’t specified by me to be included. So, the solution was to exclude three folders that USMT tried to migrate anyway. The folders that were included by USMT contrary to my settings where these: C:\Program Files, C:\Windows and C:\ProgramData. The goal of this article is to describe how to insert Software Updates into the Base Image, the Windows-image you want to base your Operating System deployment on, in SCCM Native Mode. Obviously you will want to update your image with new Software Updates every once in a while – but that will not be manual labour but automated in the task-sequence that builds the Base Image. That said. I finally managed to get this to work. It took a a week of Googling, trial and error, troubleshooting, late nights and lots of coffee. And the silly thing is that’s it pretty easy to get it to work – if you know exactly what to do. As always. Use only one Hotfix (KB2509007). Use SLP as a parameter for your CM-client. Check “Allow HTTP for roaming…” and rebuild the boot-image. Run a script to trigger software updates scan and run it a couple of times! Let’s get on with it. What are we talking about here? 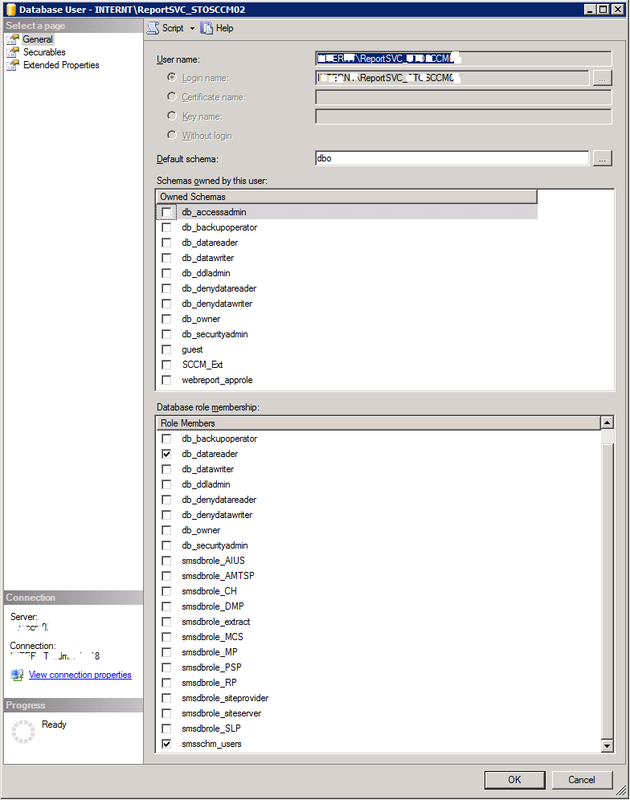 User backup of all important files, bookmarks, user profiles and their desktops using Microsoft User State Migration Toolkit v4. We want to do this not from within Windows but during the Windows PE state before we apply a new OS. The good thing about doing this in Windows PE and with Hardlinks is pronounced Speed. Hardlinks make file copying locally and over the network unnecessary. It needs no extra disk space and there won’t be any locked files as when you’re doing migrations from within Windows. It’s not magic but it’s pretty close. Also if you have a computer that doesn’t boot into Windows but has lots of important files on it and with a readable disk – this is the only way to copy that data. The only thing you can’t do with USMT and Hardlinks in Windows PE is if you’re replacing the hardware. USMT with hardlinks in Windows PE mode is for re-installing the computer with a new OS (or OS version) only. For other scenarios you need a server-state store. That method is not covered in this post. Let’s jump straight to business. Here’s what my Task-sequence looks like, stripped off stuff that’s not important for what we’re trying to illustrate here. An error occurred during client rendering. Query execution failed for dataset ‘DataSet2’. 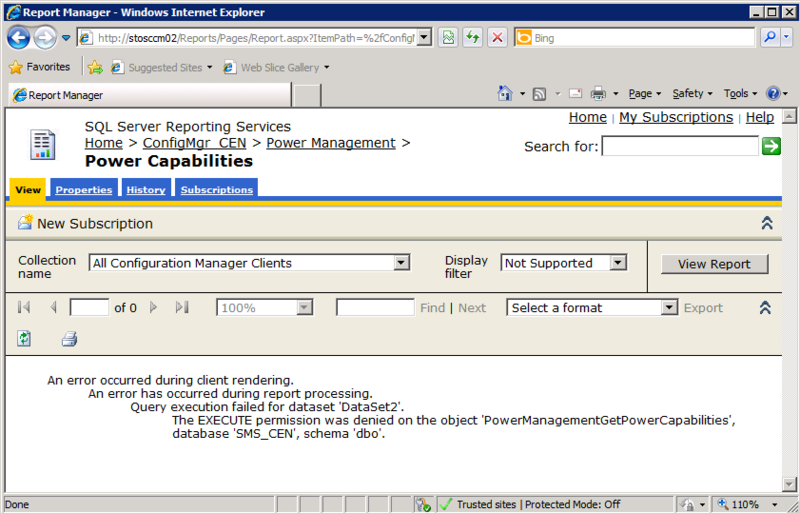 ‘PowerManagementGetPowerCapabilities’, database ‘SMS_CEN’, schema ‘dbo’. Right, so you’re trying to view a report in Reporting Sevices that you copied from ConfigMgr and now you’re getting this. What is wrong? 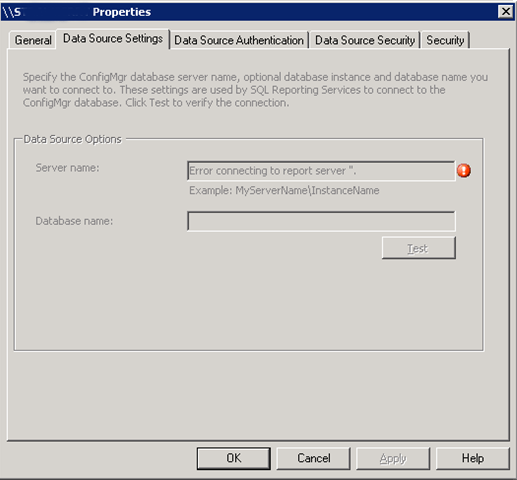 The SQL-account you’re using to access the Reporting Services database simply has insufficent rights. That’s what the message above is trying to tell us. After that, reports work great. 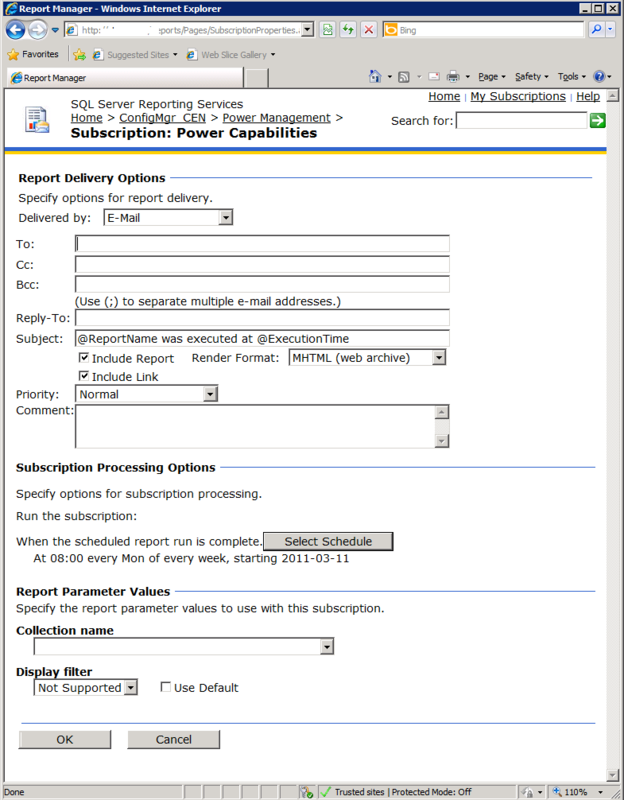 Subscribing to reports is really great to show to upper managment. How do you make that work? It’s not too hard actually. 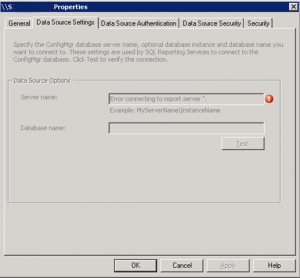 You just need to give ConfigMgr a username that has access to the database so that Reporting Services can save the information in the database. I use the same account for that as the account I specified during the installation of SQL Reporting Services. If you run into access problems, check my post above this one. Right click on your Server below Reporting Services in ConfigMgr. ... after that you should be able to subscribe to reports. …very tricky indeed. I had no idea how complicated it can be until today. 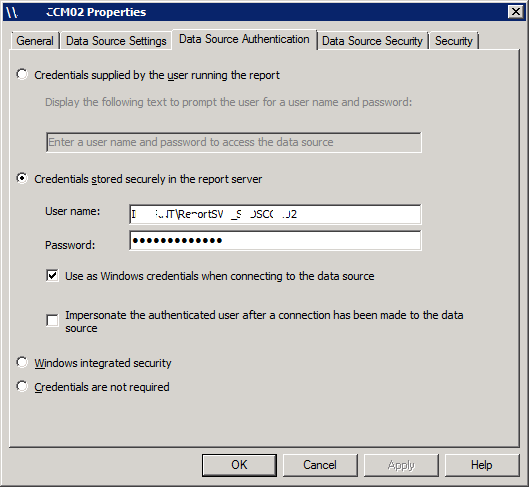 In this installation of SCCM 2007 R2 (in my case R3) with SP2 – Configuration options where greyed out in the “Copy Reports Wizard” as well as when you right click the Reporting Services Server icon below Reports in the SCCM-console. According to Microsoft this can happen if you run more than two instances of SQL Reporting Services on the same machine and that’ll make ConfigMgr confused since it automatically selects the default instance of Reporting Server through WMI. I’m pretty sure this issue happens if you choose “Install but do not configure the report server” during the SQL 2008 installation instead of “Install the native mode configuration”. I have to test this in the lab but I’m guessing the SQL RPS instance never gets created if you don’t configure RPS and therefore SCCM can’t find it. If you want to fix this, all you need to do is to open Reporting Services Configuration Manager and configure RPS manually. This one isn’t new but I haven’t encountered this problem until today. My customers WindowsPE boot image took 1 minute and 15 seconds to load. This is when the PXE-server transfers WindowsPE to the RAM-disk via TFTP. In other words, before the OS-Image gets applied. Adjusting the TFTP-packet size might shorten loading times since larger packets needs fewer acknowledgements from the client. In my customers case it was the fix. With a packet size of 8192 the WindowsPE-image transfer took 26 seconds and with a packet size of 16384 the transfer took only 20 seconds. That’s going from 2mb/s to 7.5mb/s on a 100mbit link. Add the DWord-value RamDiskTFTPBlockSize and set the decimal value to 16384. Don’t forget to restart the WDS-service after you change the registry-value. Update! With SCCM 2012 build 1606 there’s a new registry option called “TFTPWindowsSize” to modify the window size of TFTP packages. (“The receive window is the number of bytes a sender can transmit without receiving an acknowledgment.” – Microsoft). Bio: My name is Mathias Haas. I'm from Sweden and I'm the author of this blog. As a consultant since 1995 I currently specialize in SCCM at Fidelity Consulting. This blog is where I put down notes for future use. I hope it can become useful to others as well. List all subfolders, but only one level deep in a directory.